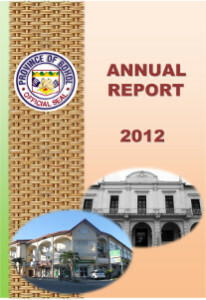 The year 2012 was a very productive period for the Province of Bohol. This is reflected in the succeeding pages of the Annual Report containing the highlights of the Provincial Government’s accomplishments. Owing to our many accomplishments, the Province of Bohol received a plethora of awards and recognition. 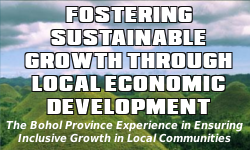 For two consecutive years, Bohol was adjudged the Best Governed Province in the country, based on the Local Governance Performance Management System (LGPMS), administered by the Department of Interior and Local government (DILG). Additional acknowledgements given by the DILG was the Gawad Pamana ng Lahi Award and the Seal of Good Housekeeping. Most recently, the Department of Social Welfare and Development (DSWD) gave the Gawad Paglilingkod sa Sambayanan in recognition of the successful welfare and development programs, interventions, and innovations resulting to greater participation, transparency and social responsibility for the Province of Bohol. The DSWD also gave the Panata Ko sa Bayan Award for our commitment to uplift the lives of the Boholano people through responsive, transparent and accountable governance and services, under the HEAT Bohol Development Agenda and LIFE HELPS strategies. Then there are the awards garnered by the province, such as the Best Province and Public Service Office Partner in Anti-Illegal Recruitment (PAIR) given by the Philippine Overseas Employment Administration (POEA), Most Outstanding Provincial Library in the Philippines (2nd Place nationwide), Best Implementation of the Classroom Building Program under the Bayanihan Long-Term Partnership for Education given by the Department of Education (DepEd), The Outstanding Philippine Organic Agriculturist (TOPOA) given to the governor by the Rotary Club of Cubao East and JCI. the Bayanihan Award given by the Armed Forces of the Philippines (AFP) to Bohol’s Prosperity Team Leader, Ms. Liza M. Quirog, and many other awards that are all mentioned in this Annual Report. All these awards and recognition would not have been made possible without the full support and cooperation of the civil society organizations, the academe, the military, the church, the business sector, the local government units, national government agencies, and, of course, our hardworking and declared provincial government employees. To our beloved people of Bohol, we offer you all our efforts and accomplishments. To God be the glory!